I wrote a recap of my Boston Marathon for the Nova blog for OKCU. You can access it here. When I conceived of the Deb Heine Endowed Scholarship, it was December of 2015. I had the idea to run a 12-hour race to begin raising funds for it, and that race was in October of 2016. I began 2016 with a renewed focus and an eye on that race, which was nearly 10 months away. Since the beginning of 2016, which spans 27 months, I have run over 6000 miles. If I had $5 for every mile, there would be $30,000 in the scholarship. If I had $8 for every mile, there would be $48,000 in the scholarship. I'm not there yet; I need your help. As I write this, I have over 2 weeks before the Boston Marathon. I've completed my heavy training. I've done speed work and I've put in the long miles, with my longest run of 21 miles. I've run training 5Ks under 20 minutes. I've run a training mile in under 6 minutes. I've done a 12-mile training run under 1:24:00. I'm ready to attack Boston. I'm ready to represent Oklahoma City University and make everyone proud. I'm excited about planning this trip and this race. At this point, I won't have too much to report until race time, but I'll be ready to share my experiences with everyone once I return from Boston. Can you help me cross the financial finish line? I'll cross the one in Boston. Let's cross the one in Oklahoma City together. Right on Hereford, Left on Boylston. Through to the finish. Spring Break is over, and classes have resumed. Midterm exams are graded, and we have six weeks to go before Final Exams. Today was the first day back at work, and I was able to get more done than I thought possible. I've gotten incredibly efficient while I'm at school, which is good since I'm going to need to start getting more sleep because the Boston Marathon is only FOUR WEEKS AWAY!!!!! I'm now at the point where the end of my training is near, and I'll be able to enjoy everything a bit more. Much of my work today dealt with locating cues in the film The Matrix. One line of dialogue struck me as particularly important while watching it: "You're faster than this. Don't think you are, know you are." I had to apply it to my tempo workout today — a hard 5K, made much harder by the 40+mph Oklahoma wind gusts. I kept repeating it to myself while I was running, moving faster and faster, and I met my goal time despite the wind. It felt good to know that I have so much more in me than I did at the beginning of the year. Lots of work still needs to be done before I fly to Boston, but I'm confident I'll finish it all and be ready to run on April 16. I still need your help and your donations to fund this scholarship. I'm trying to be as motivational as I can to the students and to the supporters. Please help me in sharing this story and making any sized contribution. Oklahoma City University is on spring break this week, which means I have some extra time to work, do course prep, and grade my midterms from last week. While I don't really get any "time off" this week, it's been productive so far, and I hope it will continue to be productive. Since I last checked in, I crossed a major barrier in training: I ran 19:32 for a 5K as part of a workout, 28 seconds faster than last month, which is a huge amount. That time works out to a 6:17/mile pace. That's not a pace I could hold for the marathon, or half marathon, but it's pretty good for having taught four classes earlier in the day. I finally feel as though I'm recovering from that race, and just in time to do speedwork on Wednesday and a long run (I did 18 miles last week) on Thursday. The Boston Marathon is just over one month away. I'm starting to get pretty excited about what I might be able to do in the race. I also learned this week that I'll be in Wave 2, but in Corral 1. That means I'll be at the front of the fast-but-not-insanely-fast runners. However, if things break right, I could have a fantastic day, and I'm counting on it. Lots of exciting things are coming in the rest of the month, so stay tuned. I have run over 500 miles since the start of 2018. That's 9 weeks and 1 day. 64 days. Over 500 miles, which works out to an average of close to 8 miles a day. However, I always take Fridays off, so I've run on 55 days this year, meaning an "average" run distance is a little over 9 miles. It's March, which means that I can now say the Boston Marathon is "next month." It's a bit strange to say it aloud, but that means the race is getting close. I still have lots of work to do, both in training and for teaching. I can't say that the hardest work is behind me, because it isn't. The next four weeks will physically challenge me in a way that I haven't been challenged since I was in high school. I still have to get faster and stronger. I need to know that my efforts are making a difference. The scholarship is still only in four figures, so there's a long way to go to meet my goal of $50,000 for this scholarship. Sometimes I wonder if we'll get there. Sometimes I wonder why I'm putting all of this effort into the run. I have to believe that there are people out there who would be inspired and motivated by my efforts to financially support my scholarship. I have to believe it. I hope that this is the week that donations begin pouring in. The weather this past week made training much more difficult than normal, and yet I still had a week of more than 60 miles, including 17 on the treadmill on Thursday. 17 miles is almost 2/3 of a marathon; in some ways it was mentally more difficult than an actual marathon because the scenery never changed. "Why, Mr. Anderson? Why, why, why? Why do you do it? Why get up? Why keep fighting? Do you believe you're fighting for something? For more than your survival? Can you tell me what it is? Do you even know? Is it freedom? Or truth? Perhaps peace? Could it be for love? Illusions, Mr. Anderson. Vagaries of perception. Temporary constructs of a feeble human intellect trying desperately to justify an existence that is without meaning or purpose. And all of them as artificial as the Matrix itself, although only a human mind could invent something as insipid as love. You must be able to see it, Mr. Anderson. You must know it by now. You can't win. It's pointless to keep fighting. Why, Mr. Anderson? Why? Why do you persist?" Some people ask me why I run as long or as far as I do. On some level, I know that I get something out of it, physically and health -wise. I don't really think about much when I'm running, although sometimes I do use the time to work out problems in my own research or teaching. For this particular challenge - the Boston Marathon - I'm enduring so that future students will not have to feel as much of a financial struggle. This isn't something that anyone told me I had to do. I'm choosing to do this. That's really the reason. I feel compelled to do it. I want to help my students in ways far beyond the classroom. My times are steadily improving. I'm much faster than I was last year in my training, and in less than two weeks, I'll be racing an 8K pushing my disabled son. I'm hoping to finish in the Top Three of all runners 40+. I'm training for something really big. I need your help and support. I need this scholarship to be funded. This is 100% for the students at the Wanda L. Bass School of Music. If someone asks why you supported this particular cause, feel free to say, "Because I choose to." Much like the weather in Oklahoma City this winter, my training week had a huge peak and a huge valley. Last Monday, I had a huge breakthrough - on part of my 3 1/2 mile tempo run, I hit a 5K in 19:59. I haven't run a sub-20:00 5K since I was 18 years old! It was a huge confidence boost, and I took that energy with me into Tuesday and Wednesday. Thursday was the breakdown. On Thursday, the temperature was pushing 80º, and the wind was 25-30mph. I was scheduled to do a 16-mile run, but the heat and the wind took a huge toll on my body, and I didn't even make it to 12 miles. I felt embarrassed and ashamed. After all, if I couldn't even run 12 miles, how would I make it through the Boston Marathon? After a couple hours of self-pity, I put it aside, took my standard day off on Friday, and got back to it on Saturday. I got to run almost 3 1/2 miles pushing Stephen in his new chair, and we did it at a 7:21/mile pace. It didn't feel like I was working hard at all. Then I went out for another 4 miles on my own, at a pace under 7:00/mile, and with the last mile in 6:33. I let my high get too high, and my low get too low this week. I'm lucky that I have a good coach and a good spouse around me to help keep things in perspective. This next week of training isn't going to get any easier, with wild temperature swings and intense winds. I just have to keep pushing through everything. 8 weeks to go until the race. Please share what I'm doing with your friends. I'm the vessel. I have to help as many students as I can through this endeavor. 9 weeks to go until the race. 9 weeks. 63 days. It seemed like last week when the marathon was 100 days away. Time is absolutely flying. The new class is a blast, but creating film clips takes time. I'm also in charge of the university's Undergraduate Research Day, so that will be taking up a significant amount of time over the next two weeks. My coach tells me I'm about to enter "Phase 2" of training. I'm not sure what that means other than more miles and faster paces than before. While I'm not quite hitting my desired marks, I am making improvements, even week to week, so being able to see the progress is quite exciting. Last Thursday, I had my long run - 15 miles. It came a day after simulated hill work in 1/2 mile bursts. The first 11 were at a 7:35/mile pace, while the last 4 were at 7:02. The idea is to simulate exhausted legs at the end of a marathon, and then push even harder. What I am doing is not easy. I'm pretty tired most of the time, but when my mind wanders during easier runs, I start thinking about how the money I raise from the endeavor can make a world of difference for a student every year. I've even thought about how many students could be helped if we exceed our $50,000 goal, and had, say, $100,000 in the endowment. I've got a lot of work to do, both training and school, in the next 9 weeks, so I should probably get to it. It's exactly 10 weeks until the Boston Marathon. 70 days. It sounds like a long time. It isn't. It means 10 training cycles. Only 10 more "long runs." Only 10 weeks to lose 10-12 pounds and get my weight to where I want it to be. This past week I had a small breakthrough. I've been struggling with the wind, as this Winter has been the windiest I can remember. My times haven't been where my coach has wanted them, and I've been fighting against 25-30mph winds daily. During my mile repeat workout (1 mile hard, 1/2 mile recovery), I finally broke through the 6:30 barrier, and ran 6:24, 6;27, and 6:31. That was the workout that I needed to have to show me that I can get close to my goal time in Boston. Running is certainly physical, but the mental aspect of running often is overlooked. Our minds can fool us into thinking that we cannot accomplish the physical elements we want. We have to convince the brain to keep working, rather than the brain convincing us to slow down. The battle never gets easier, only more familiar. I'm battling through the wind; it will only make me stronger. Time to check in, since it's the end of January. Quite a bit has happened this month. It's just under 11 weeks to go until the Boston Marathon, and my training has really gotten intense. In January, three significant things have happened that I'd like to tell you about. First, I'm teaching a brand-new class this semester on the analysis of film music, which is my area of research. My class is reading journal articles and book chapters, and has been working through analyzing such concert works as Aaron Copland's Appalachian Spring and movements from Gustav Holst's The Planets, among other works. Before Spring Break, we'll get to look at scores from 1951's The Day the Earth Stood Still and 1968's Planet of the Apes. It's quite exciting for me, but performing all of the analysis myself, and getting audio and video clips together is time consuming. The second important thing is that I now have a coach, because even teachers need teachers. My coach, Gail, lives in upstate New York and is writing a training plan for me based on a time goal at Boston. I'm doing a tempo run once a week, as well as intervals. I'm not where I want to be yet, in terms of times, but I know that she'll help me get there. I also have to re-learn how to endure the physical pain of running fast for long periods of time. When I was 16, it didn't feel so bad, but it does now. Once I can cross that threshold, I'll be ready to really fly. The most important event this month is that we've acquired a new Hoyt Running Chair for my son, Stephen, who had outgrown his old adaptive chair. We wouldn't have been able to purchase the chair without help from our friends at the charity Ride to Give. This is an adaptive running wheelchair that he'll be able to use into early adulthood. I have to continue to stay in shape so that I can keep running with an pushing him. He's not getting any smaller! As we near the end of the month, I should hit about 240 miles in January. My goal for February is to embrace the physical suffering of speedwork. If I can suffer for 25-35 minutes three times a week, and it will relieve the financial burden on a student, it's all worthwhile. We've got some fundraising still to do. I'll cross that finish line in Boston. Please help me cross the finish line of this endowed scholarship. 2017 was a good running year for me. After completing the 12-hour race in October 2016, I set my sights on a new goal: qualifying for the Boston Marathon. Based on some of my long training runs, I thought I would be close enough to take a shot a meeting the qualifying time. After a spring of intense training, I ran 3:11:21 in the Oklahoma City Memorial Marathon on April 29, 2017, besting the minimum qualifying time by more than three minutes. I had to wait until September to find out if I got in or not, as Boston only takes those with the greatest times under the qualifying minimum. The cutoff turned out to be 3 minutes and 26 seconds under the minimum. I was 3 minutes and 39 seconds under, so I made it by 13 seconds, or 1 second for every 2 miles. I ran a handful of races during the year, including two races where I pushed my son Stephen in his adaptive wheelchair where we were the overall winners! I'm looking forward to the challenge of training for Boston, which will be my last marathon, and working to achieve a time that will make everyone proud. I ran over 2600 miles in 2017, but the intense training starts now. It's now Thursday, October 27. My race occurred five days ago. Enough time has passed that I am able to talk about it now. While it may be your first question, it isn't the most important: I ran 71.85 miles in 12 hours. The journey of the day is far more interesting. Our little one-year-old woke up with a diaper blowout at 3am, but my wife was able to get him back to sleep. I had the alarm set for 4am, so I got in a little more rest, and when the alarm sounded at 4, I popped up out of bed, excited for the day. I got dressed, had a breakfast of an avocado and a hash brown, and gathered all of my "day of" belongings, since I'd set up my test the previous morning. I left the house around 5am and headed out to the park. Different weather apps gave different temperature readings, anywhere from 47º to 54º. That may not sound like much, but running in 47º means an extra two hours of cooler temperatures. Once I got out to the park, I unpacked, put on my iPod, and put on my game face. If you've ever run a 5K, you've likely seen people getting ready by running short sprints or just getting loose. There's none of that here. The first hour is for getting loose! We were called to the start line shortly before 6am, given a short set of instructions, and then we were off. I had a lead for about 60 meters, and one guy shot past me. Because I was so excited, I went with him, and ended up running my first mile in about 7:18, far too fast for what the day had in store. I had to keep telling myself to run my own race and not worry about anything else. The expression "It's a marathon, not a sprint" is somewhat apropos, but this version is "It's a 12-hour race, not a 3-hour race." I ran 8 laps in the first hour (1 lap = 0.971 miles), and almost another 8 in the second hour. At this point, I was cranking out 7:40-7:50 miles, not feeling like I was working too hard. All of the pre-dawn training was proving effective (I ran loops in the dark all summer and all through the semester). I hit the marathon point just after 3 hours and 30 minutes into the race, and hit 30 miles shortly after 4 hours. It was now just after 10am, and the weather was heating up. My plan was to bank 30 miles by 10:15am, and then hold on as much as possible for the rest of the day. Here was the new battle: 10 miles every 2 hours. For a runner, 12-minute miles are almost too slow, but when other issues like hydration and food are factored in, it starts to feel normal. I didn't have to start walking until mile 32 or 33, and that's when it started to get hard. This course has a lot of rolling hills. After 5 loops, it doesn't make a difference, but after 35 loops, the legs hurt. I made it to 41 miles at the halfway/6-hour point. It was now noon, and friends were started to appear in my tent! And I was on pace to hit 70 miles! The best part about running on a loop is that I get big cheers every mile, and that's what kept me going. Knowing that I had to be running when I came around the corner before the tent kept me motivated. I hit 50 miles in 7 hours and 51 minutes, and this is when I had serious hopes about reaching 70. The next two hours were incredibly difficult, as it was the hottest part of the day, and I was struggling. Eating is difficult in a race like this; I ate grilled cheese, pickles, and hamburger bites. I drank water, Skratch, had a couple cups of Coke, and even went for pickle juice once, in an attempt to ward off cramping. I reached the 100 kilometer mark (62.23 miles) in a little over 10 hours, but at this point I was really suffering. At 10 hours, I had 63 laps. My goal had shifted from 70 miles to completing 73 laps, which would have been closer to 71 miles than 70. 10 laps to go. 5 laps each hour. By now, I was walking about 1/4 mile, and running the other (almost) 3/4, but I was having to stop every lap for hydration, rather than every other lap, and that takes time. But my family came out a second time, and then current students came out. I got a big rush from that, and found a way to pound out 5.5 laps in Hour 11. At some point in the afternoon, I stopped seeing the leader's name on the board. I thought maybe he had dropped out. Then I saw that hourly updates were being printed. At the 8-hour mark, I knew that I had a one-lap lead. By Hour 10, it was 2 laps, and at the start of Hour 11, it was close to 3 laps. I started feeling pretty confident that I could win, so I took an unplanned walking break. It was a mistake. He blew past me like I was standing still, which, to be honest, I almost was! It was the kick in the rear that I needed. I was starting lap 68. I needed to go if I was going to win. But I was running on fumes. I got back to the tent before crossing the timing mat, and someone asked me if I needed anything. My response: "I need it to be 6pm!" I had to just keep moving. Run a little, walk a little. Turning on the machine hurt, but stopping would be worse. I had completed 71 laps with 42 minutes to go in the race, when I decided to hydrate one last time and walk a bit. I ended up walking a lap with a wonderful gentleman, Alan Countryman. It was just what I needed to fight through to the end. We had a wonderful chat while walking a 15-minute mile, and it recharged my batteries enough to get through the last 20 minutes. I knew that I could run two more laps, and finished lap 72 with exactly 20 minutes to go. I had already started to run, and I wasn't stopping until the end. I also hadn't seen the guy behind me, which meant that I had more than a 1-lap lead with 20 minutes to go. And if I was running the whole time, I wouldn't get passed, and I'd win! I cranked out a 9:05 lap for #73, and then found a way to go faster, an 8:59 lap for #74! I crossed the timing mat with less than a minute to go, kept charging through the aid tent, and made it a little further before I was done and the end of the race was signaled. I put my flag in the ground and headed back toward the aid station for some food and drink. The best part about the last hour is that when my family left, my students took their place. They cheered. They laughed. They took the time to come out and cheer for their professor, not for extra credit, not to gain favor, but because they thought I could use the support, and they were right. That's why I did this: for them, for the OCU students. We have wonderful students, and I want to be able to help them. Some issues I can help with, particularly those in the classroom, but I cannot help with financial issues. This is my way to try to help in that area. I left it all on the pavement on October 22. I was able to write thank you notes to people who donated and pledged well before the race, and my last sentence was always, "October 22 will be a great day!" It turned out to be better than great. It was amazing. I cannot thank everyone enough for their support as I trained for this race, and was out there running. Now we have to get this scholarship funded. Please share the video from the main page with anyone who may be interested in why I did what I did. It's not about me. It's about "this professor who wanted to help his students, so he ran almost 72 miles in 12 hours to fund an endowed scholarship. Isn't that cool?" My training for this race is done. I'm now in rest mode, saving energy for Saturday's race. I can hardly believe that it's only two days away. It doesn't seem that long ago that I came to Dean Mark Parker about this idea, but it was about 10 months ago. It really doesn't seem that long ago that he announced it, but it was about 9 weeks ago. And here I am, less than 48 hours away from this event. As it is with any long-term goal, the reward isn't the final goal, but the journey taken to get there. I've put in almost 2200 miles this calendar year (2190, to be exact), and along the way, I've lost a little weight, pushed my disabled son in a half marathon (1:43:44), and hopefully inspired many people along the way. I've had students ask me about my running, and friends ask about my eating habits. I've gotten faster. Events that are so highly publicized can go smashingly, or they can go poorly, or somewhere in between. As a music professor, I know that the performance is the culmination of hours upon hours of rehearsal, practice, and preparation. A little bit of anxiety is a good thing; it keeps us sharp. Nervousness means that the performer is not prepared, and knows it. At this point, I'm mostly excited, and a little anxious. But I know I've put in the miles, the time, and I'm prepared for whatever happens. If a worst-case scenario occurs, so be it, but I'm going for a best-case scenario. I've played out, in my head, the mileage that I want to achieve for every two hour segment, as both a "Plan A" and a "Plan B." Plan B will get me to 50 miles. Plan A will take me much further. I'm shooting for Plan A. 5:00am comes early. Not every run will feel good. Not every run will be "the best." My attempt is daring to be great, in an effort to inspire others to help me create this scholarship. This scholarship can help OCU students be great, to accomplish and achieve great performances. Please consider donating to this endeavor. My next post will be after the race. My legs my be spent, but my heart won't be. Thank you for all of your support, and I hope to see lots of friendly faces at Bluff Creek on Saturday the 22nd. The cooler morning temperatures made this an enjoyable week, even before dawn! 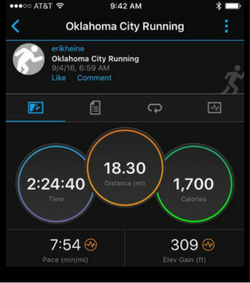 I ran 71.2 miles during the week ending on October 1 (Sept 25-Oct 1), and nearly all of my runs were at a sub-8:00/mile pace. I hadn't had a harder fast run in a while, so I went for one on Wednesday morning: 6.31 miles at a 6:56/mile pace. That's waaaaaaay faster than I'll be going in the 12-hour race, but it's nice to know that it's there when I need it. I was even able to push my son a little over 8 miles at a 7:42/mile pace. Pushing 100 pounds of chair and boy is unlike anything else. It certainly makes running solo much easier! On Sunday, October 2, I went for my last really long run. For this run, I tried to simulate the 12-hour race as closely as possible: I was out just after 6am, didn't pause my watch for water or Gu breaks, and tried to run an even pace. I ended up with a performance with which I am pleased, and one that gives me a great deal of confidence heading into the race. I put times and distances in here because I am trying to impress you. I want you to be proud of the performance that I hope to deliver on October 22, and I want you to be impressed and share this with everyone you know. I want you to be so amazed that you'll consider donating to this scholarship. We haven't raised enough money yet, and I really need your help. Please consider donating or making a per-mile pledge. I'm just the vehicle - the music students of OCU will be the beneficiaries! I've had a tremendous three weeks of training since I last updated. I've had two weeks of more than 60 miles, and one week of over 70 miles. In that week, I actually did a double one day: 11 miles in the morning, 6 miles in the evening. However, I'm not 17 anymore, and that pretty well beat me up. It took nearly a week to get the spring back in my legs. My long runs on Sunday have been fantastic: 22.72 (3 hours), 20.05 (2:36 hours), and 26.86 miles (3:30) The race is in four weeks, and I'm getting mentally prepared for moving for twelve hours. My body is almost ready. Here's the biggest long run yet (I came through the marathon distance in 3:24:47, a respectable time); not anywhere close to maximum effort, just a solid run. Getting up to run before school is not natural for me, but running in 70º darkness is preferable to running in 90º+ sunshine. I've had a couple of good long runs, but I'm really looking forward to the temperatures going down and slowing down my pace so that I can be out for 2 1/2-3 hours, and even longer. Thank you for your continued support and encouragement. The beginning of the school year is here. So far this calendar year, I've run over 1600 miles. My longest run this year was a 16-miler that I did on August 14. My long Sunday runs are going to continue to get longer, peaking with a run of 26-30 miles in early October (UPDATE: I DID 28 MILES ON OCTOBER 2). I'll try to update this page every week or so. 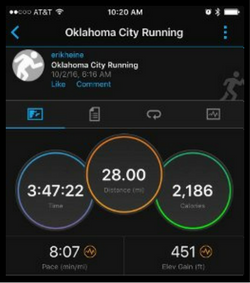 If you want to follow my training and have a Garmin Connect account, please go to connect.garmin.com and search for my profile: erikheine. Training has begun. Oklahoma City Memorial Half Marathon: 1:43:44 (while pushing my son in his adaptive wheelchair). View Erik's race results here!